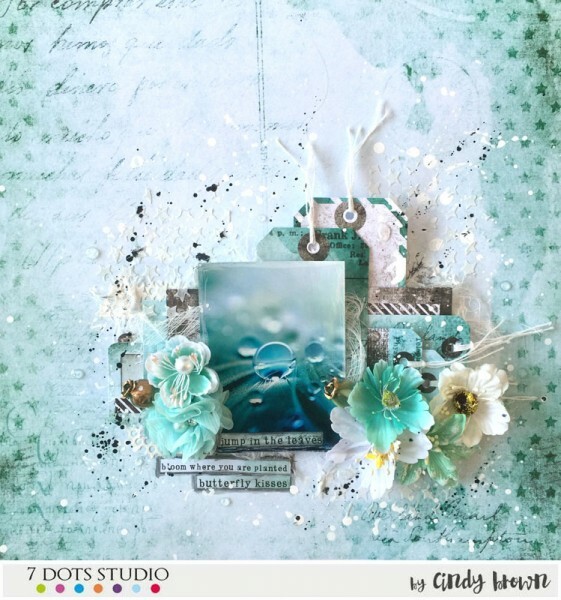 In this creation I had fun with a new collection, I love it especially it’s magnificent Teal colour. This collection blends wonderfully with this theme. Not to mention my splashing with lot of flowers. I love monochromatic layouts. immediately I got ideas of a wintry, snowy layout. So that’s what I tried to achieve here. I used the beautiful paper from Writer’s block ‘Sincerely’ because it already has that wintry feeling. I used some clear and white gesso on it, just dabbing with a tissue, to give it a snow-look. I used the letters stencil with modelling paste, and when the paste was still wet, I poured ultra fine white glitters on it. 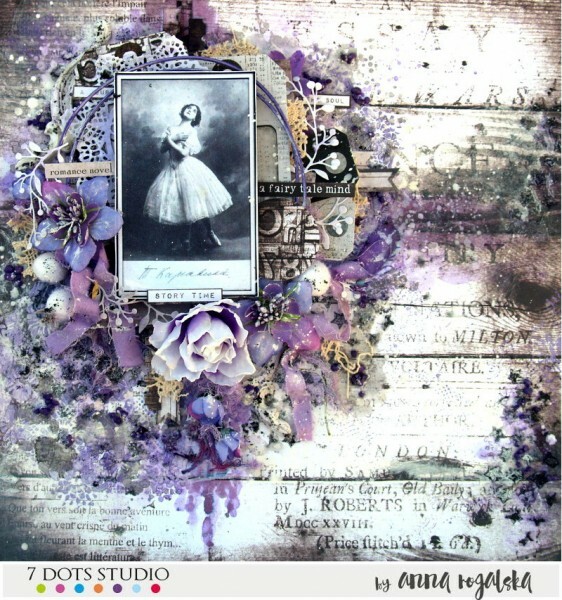 I build my page with lace, photo’s, cut out squares from tags, chipboard, wire, flowers leaves and more. 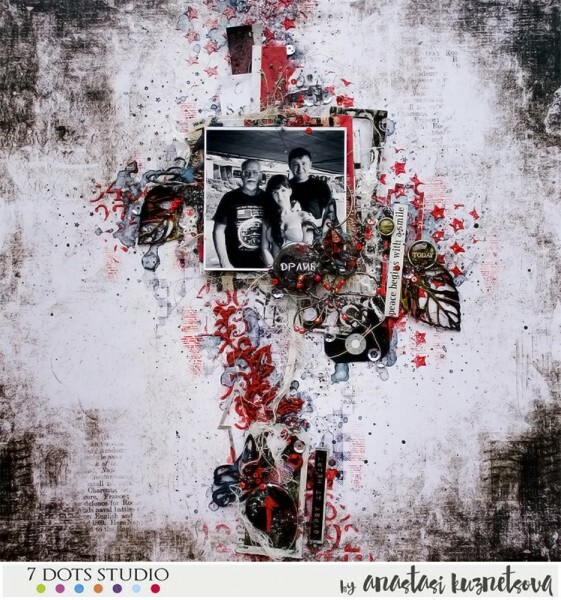 My chipboard pieces and flowers are painted black and again dabbed with some white gesso over it. I added more embellishments, die cut stars, rhinestones, glass beads, straws, and more glitter. To tell you the truth I have noticed that monochromatic layouts are a BIG challenge for me. But I am so in love with the colours of the new Cotton Candy Dreams collection that it was a real pleasure to work with these papers!!! I used the “Mint Julep” paper for my background with a thin layer of white gesso and orange ink spray. 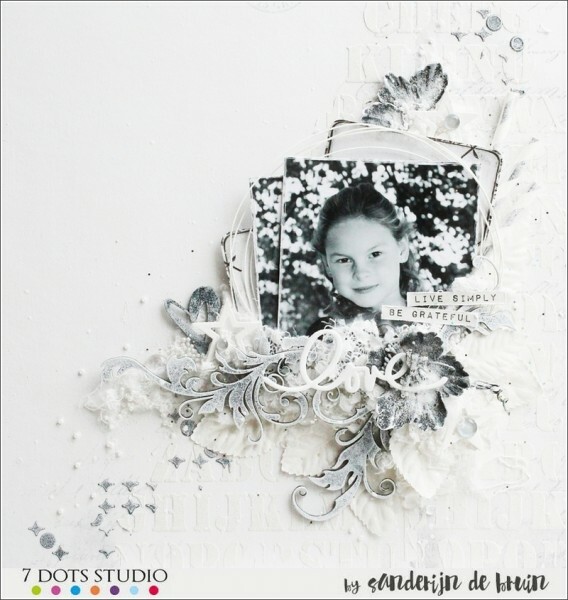 Lot of embellishments of the same colour, Words stickers and Elements. I present to you my art spread, I’m a girl and I love the colour pink! 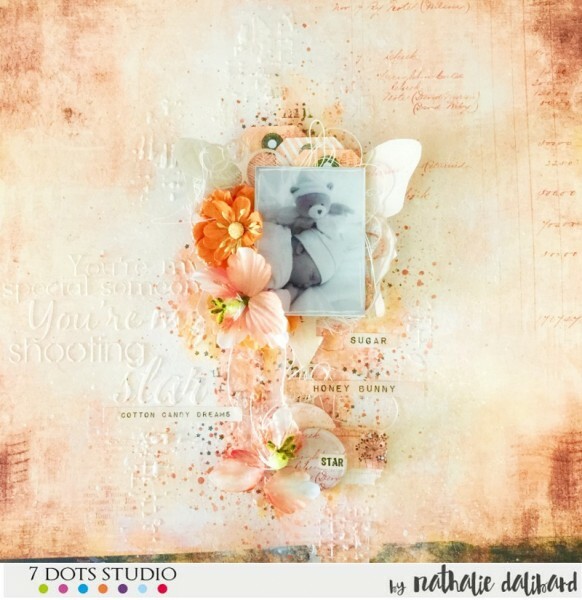 For this challenge I created a romantic layout, using a new stunning 7 Dots Studio Collection “Writer’s Block” with a lot of flowers and mixedmedia techniques. Creating monochromatic projects is a really challenging and SO much fun! 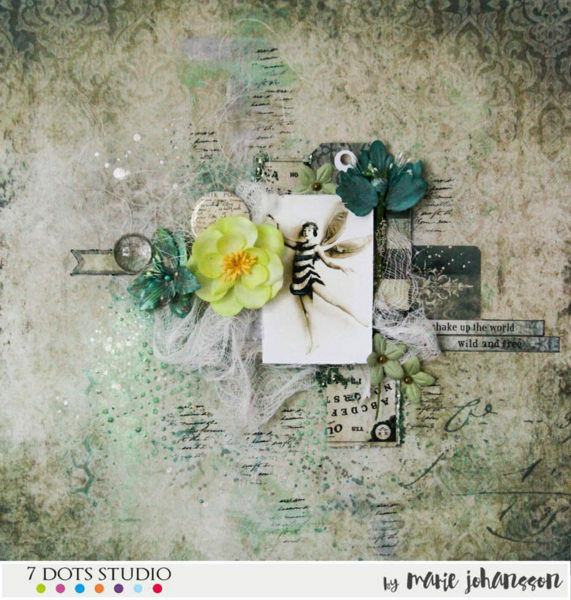 I sorted trough all my 7 Dots Studio stash and mixed a lot of papers & embellishments that had the same green and grey tone. 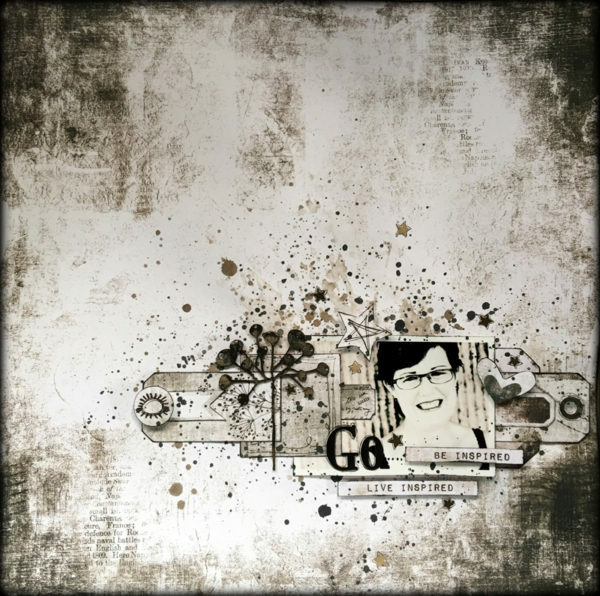 The “Palmistry” 12×12 paper from the Fortune-teller Collection set the tone and from that I had a great time playing with stencils, Glimmer Mists, stamps & embellishments. 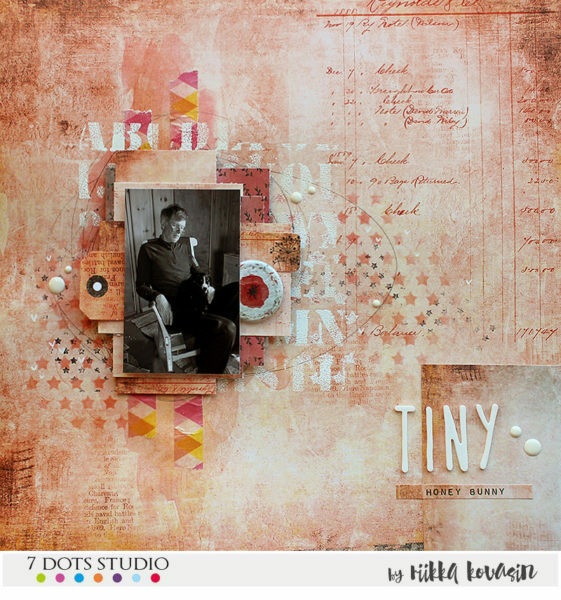 I really love the feeling in the finished layout – the colours seem dreamy & a bit punky and rebellious. 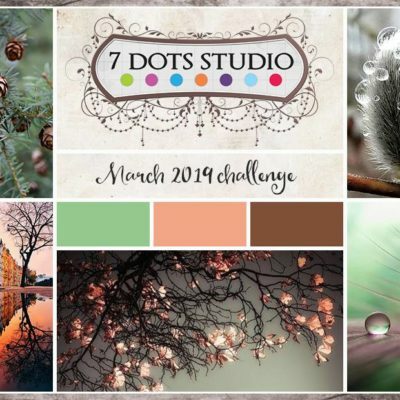 This challenge proved surprisingly difficult! I usually tend to use analogous color scheme in my projects so it should’ve been a piece of cake. But you know when something is not allowed, it’s just the time you really would like to use it? Lol! But the other difficulty was to choose the color! As I normally gravitate towards blue and turquoise hues I went with a peachy colors this time and did a page about a small puppy, all grown now. 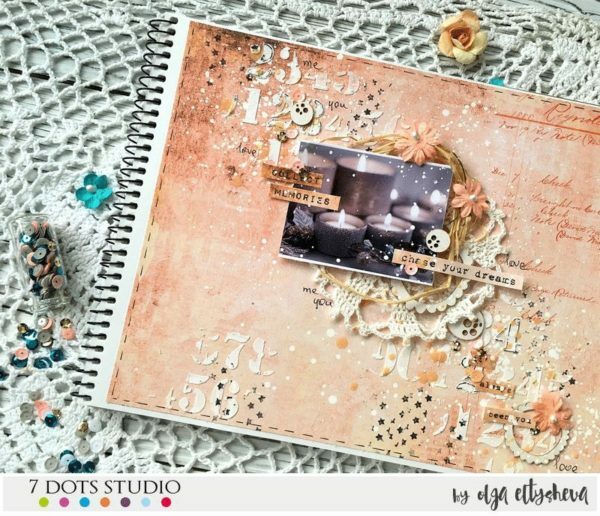 Louise has chosen to use one of our fabulous new release ranges to create a simple but effective monochromatic [brown and white] layout. Don’t you just love the Cotton Candy Dreams range?!! I’ve created a canvas with picture taken in a deep forest. I am charmed by its browns and greens merged together. Sometimes I dream about living deep in the forest. That would be wonderful, don’t You think? 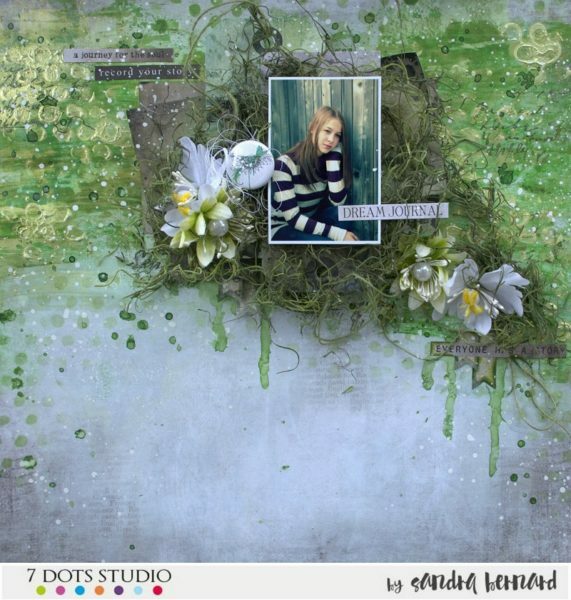 To create this project I used Writers Block and Nature Walk collections. I love red. I’m not afraid to use it in my work! And today, my choice fell on it. In the photo, my husband and professor, with whom we met while on vacation in Goa! Interesting man, who left very good memories in our hearts. 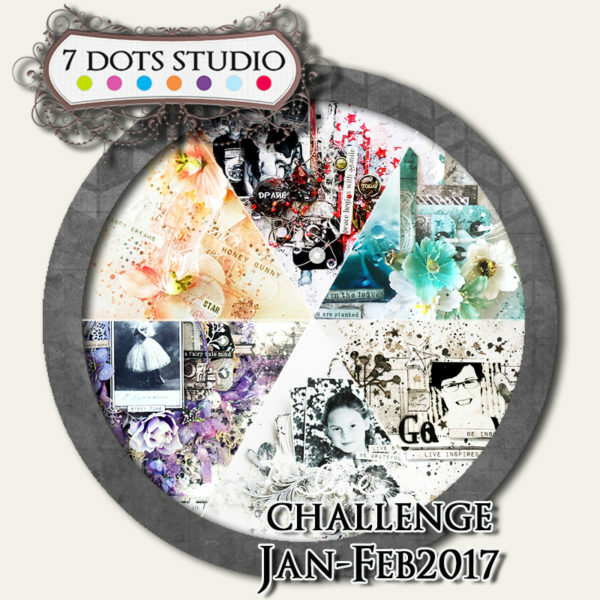 Challenge is open till February 2017, 19th midnight CET. We announce winners by the end of the February. This year, because of the overwhelming amount of wonderful projects, we decided to reward top 3 creations. The main winner is going to win One Collection Kit!